Gigi Hadid is facing backlash after posting a photo on Instagram sponsored by McDonald’s. Many fans criticized Hadid for working with the fast-food giant, linking McDonald’s to obesity and low employee pay. McDonald’s has been working to shift its reputation in recent years, with changes such as launching cage-free eggs and burgers made with fresh beef and ending lobbying against minimum-wage increases. 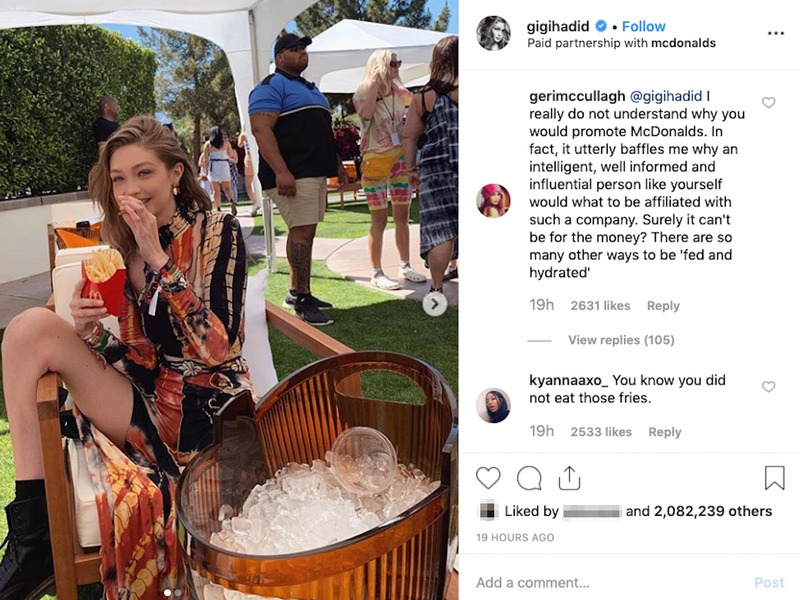 Fashion model Gigi Hadid is facing backlash for a recent Instagram post sponsored by McDonald’s — and it reveals a challenge that the fast-food giant is still struggling to solve. On Sunday, Hadid posted a photo on Instagram that showed herself eating McDonald’s at Coachella. While plenty of Hadid’s fans loved the photo — which has been liked more than two million times as of Monday morning — others took issue with her partnering with the fast-food chain. “I really do not understand why you would promote McDonalds,” reads one comment that has been liked by more than 2,600 people. Masters preview: Which players could take the green jacket?